↑ Linnaeus, Carl (1753). "Narcissus". Species Plantarum vol. 1. p. 289. Retrieved 2 October 2014. ↑ "Daffadowndilly". Collins English Dictionary. ↑ Thomé 1903, p. 316. Plinius Secundus, Gaius (Pliny the Elder) (1856). Bostock, John; Riley, H. T., eds. Natural History Book XXI (Volume Four). London: Henry G Bohn. ശേഖരിച്ചത്: 3 October 2014. Plinius Secundus, Gaius (Pliny the Elder) (1906). Mayhoff, Karl Friedrich Theodor, ed. "Naturalis Historia". Perseus Digital Library. ശേഖരിച്ചത്: 3 October 2014. Vergilius Maro, Publius (Virgil) (1770). Davidson, Joseph, ed. The Works of Virgil: Translated Into English Prose, as Near the Original as the Different Idioms of the Latin and English Languages Will Allow & etc (5 ed.). London: J Beecroft et al. ശേഖരിച്ചത്: 27 September 2014. Pausanias (1918). Jones, W.H.S., ed. "Description of Greece". Perseus Digital Library. Cambridge MA: Harvard University Press. ശേഖരിച്ചത്: 19 October 2014. Dioscuridis Anazarbei, Pedanii (1906). Wellman, Max, ed. De materia medica libri quinque. Volume II. Berlin: Apud Weidmannos. ശേഖരിച്ചത്: 20 October 2014. Theophrastus (1916) [4th century BC]. Hort, Arthur, ed. Περὶ φυτῶν ἱστορία [Enquiry into Plants]. ii. London and New York: William Heinemann and G.P. Putnam's Sons: Loeb Classical Library. ISBN 0-674-99077-3. Theocritus; Bion; Moschus (1880). Lang, Andrew, ed. Theocritus, Bion and Moschus rendered into English prose. London: Macmillan. ശേഖരിച്ചത്: 8 November 2014. Moschus (1919). "Εὐρώπη". എന്നതിൽ Edmonds, John Maxwell. Moschus. The Greek Bucolic Poets (Perseus Digital Library ed.). London: William Heinemann. ശേഖരിച്ചത്: 8 November 2014. Turner, William (1551). Chapman, George T. L.; Tweddle, Marilyn N.; McCombie, Frank, eds. William Turner, a New Herball Parts II and III (1995 reprint. Original at Rare Book Room Spread 188). Cambridge University Press. ISBN 0521445493. ശേഖരിച്ചത്: 2 November 2014. Clusius, Carolus (1576). Atrebat Rariorum alioquot stirpium per Hispanias observatarum historia: libris duobus expressas. Antwerp: Plantinus. ശേഖരിച്ചത്: 5 November 2014. Camerarius, Joachim (The Younger) (1588). Hortus medicus et philosophicus: In quo plurimorum stirpium breves descriptiones. Frankfurt: S. Feyerabend, H. Dack, & P. Fischer. ശേഖരിച്ചത്: 10 October 2014.
de l'Obel, Matthias (1591). Icones stirpium. Antwerp. ശേഖരിച്ചത്: 26 October 2014. Gerard, John (1597). The Herball or Generall Historie of Plantes. London: John Norton. ശേഖരിച്ചത്: 26 November 2014. Besler, Basilius (1613). Hortus Eystettensis, sive, Diligens et accurata omnium plantarum, florum, stirpium : ex variis orbis terrae partibus, singulari studio collectarum, quae in celeberrimis viridariis arcem episcopalem ibidem cingentibus, olim conspiciebantur delineatio et ad vivum repraesentatio et advivum repraesentatio opera. Nuremberg. doi:10.5962/bhl.title.45339. ശേഖരിച്ചത്: 10 October 2014. Parkinson, John (1629). Paradisi in Sole Paradisus Terrestris: Or A Garden of All Sorts of Pleasant Flowers which our English Ayre will Permitt to be Noursed Vp. With a Kitchen Garden of All Manner of Herbes, Rootes, & Fruites, for Meate or Sause Vsed with Vs, and an Orchard of All Sorte of Fruitbearing Trees and Shrubbes Fit for Our Land. Together with the Right Orderinge, Planting & Preserving of Them and Their Uses and Vertues Collected by Iohn Parkinson Apothecary of London. London: Printed by Hvmfrey Lownes and Robert Yovng at the Signe of the Starre on Bread-Street Hill. doi:10.5962/bhl.title.7100. ശേഖരിച്ചത്: 29 December 2014. Miller, Philip (1735). The Gardeners Dictionary: containing the methods of cultivating and improving the kitchen, fruit and flower garden, as also the physick garden, wilderness, conservatory, and vineyard (Abridged ed.). London: Rivington. doi:10.5962/bhl.title.28437. ശേഖരിച്ചത്: 27 December 2014. Hale, Thomas (1757). Hill, John, ed. Eden, or, A compleat body of gardening : containing plain and familiar directions for raising the several useful products of a garden, fruits, roots, and herbage, from the practice of the most successful gardeners, and the result of a long experience. London: Osborne. ശേഖരിച്ചത്: 3 November 2014. Justice, James (1771). The British gardener's new director : chiefly adapted to the climate of the northern counties: directing the necessary works in the kitchen, fruit and pleasure gardens, and in the nursery, greenhouse, and stove (5 ed.). Dublin: Exshaw. doi:10.5962/bhl.title.26951. ശേഖരിച്ചത്: 27 December 2014. Maddock, James (1792). The florist's directory : or, A treatise on the culture of flowers ; to which is added a supplementary dissertation on soils, manures, &c. London: B. White & Sons. doi:10.5962/bhl.title.16498. ശേഖരിച്ചത്: 26 December 2014. Perthensis, Encyclopaedia (1806). "Narcissus". Encyclopaedia Perthensis; or, Universal dictionary of Knowledge vol. 25. Perth. pp. 565–566. ശേഖരിച്ചത്: 28 November 2014. Linné, Carl von (1784). Murray, Johann Andreas, ed. Systema vegetabilium (14th edition of Systema Naturae). Typis et impensis Jo. Christ. Dieterich. ശേഖരിച്ചത്: 3 November 2014. Brown, Robert (1810). Prodromus florae Novae Hollandiae et Insulae Van-Diemen, exhibens characteres plantarum. London: Taylor. ശേഖരിച്ചത്: 30 October 2014. De Lamarck, Jean-Baptiste; De Candolle, Augustin Pyramus (1815a). Flore française ou descriptions succinctes de toutes les plantes qui croissent naturellement en France disposées selon une nouvelle méthode d'analyse ; et précédées par un exposé des principes élémentaires de la botanique (vol. III) (3 ed.). Paris: Desray. ശേഖരിച്ചത്: 29 October 2014. De Lamarck, Jean-Baptiste; De Candolle, Augustin Pyramus (1815b). Flore française ou descriptions succinctes de toutes les plantes qui croissent naturellement en France disposées selon une nouvelle méthode d'analyse ; et précédées par un exposé des principes élémentaires de la botanique (vol. V) (3 ed.). Paris: Desray. ശേഖരിച്ചത്: 29 October 2014. Redouté, Pierre Joseph; De Candolle, Augustin Pyramus (1805–1808). Les liliacées. Paris: Redouté. ശേഖരിച്ചത്: 1 November 2014. A. P. de Candolle (1813). Théorie élémentaire de la botanique, ou exposition des principes de la classification naturelle et de l'art de décrire et d'etudier les végétaux. ശേഖരിച്ചത്: 5 February 2014. Wilkes, John, ed. (1819). "Narcissus". Encyclopaedia Londinensis vol. 16. London. pp. 576–580. ശേഖരിച്ചത്: 2 November 2014. Anonymous (1823). "Narcissus". Flora Domestica, Or, The Portable Flower-garden : with Directions for the Treatment of Plants in Pots and Illustrations From the Works of the Poets. London: Taylor and Hessey. pp. 264–269. ശേഖരിച്ചത്: 21 December 2014. Later attributed to Elizabeth Kent and Leigh Hunt. Linnaeus, Carl (1829). Schultes, Josef August; Schultes, Julius Hermann, eds. Systema vegetabilium. Stuttgardt: J. G. Cottae. ശേഖരിച്ചത്: 25 October 2014. Herbert, William (1837). Amaryllidaceae: Preceded by an Attempt to Arrange the Monocotyledonous Orders, and Followed by a Treatise on Cross-bred Vegetables, and Supplement. London: Ridgway. ശേഖരിച്ചത്: 20 October 2014. Curtis, Thomas, ed. (1839). "Narcissus". London Encyclopaedia vol. 15. London. pp. 449–451. ശേഖരിച്ചത്: 27 November 2014. Spach, Edouard (1846). Histoire naturelle des végétaux: Phanérogames (vol 12). Paris: Roret. ശേഖരിച്ചത്: 20 October 2014. Burnett, M. A. (1850). 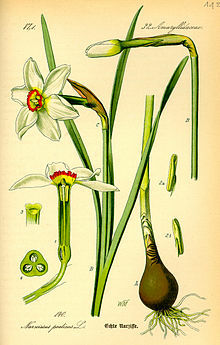 "Narcissus angustifolius". Plantae utiliores: or illustrations of useful plants, employed in the arts and medicine, Part VIII. London: Whittaker. ശേഖരിച്ചത്: 2 November 2014. Wilkinson, Caroline Catharine, Lady (1858). Weeds and wild flowers : their uses, legends, and literature. London: J. Van Voorst. ശേഖരിച്ചത്: 26 November 2014. Salisbury, Richard Anthony; Gray, J. E. (1866). The Genera of Plants (Unpublished fragment.). ശേഖരിച്ചത്: 26 October 2014. Prior, Richard Chandler Alexander (1870). On the popular names of British Plants, being an explanation of the origin and meaning of the names of our indigenous and most commonly cultivated species (2 ed.). London: Williams & Norgate. ശേഖരിച്ചത്: 6 October 2014. Earley, W (1877). "The Narcissus". The Villa Gardener vol. 7 (December). London. pp. 394–396. ശേഖരിച്ചത്: 8 November 2014. Ellacombe, Henry Nicholson (1884). The Plant-lore & Garden-craft of Shakespeare (2 ed.). London: W Satchell and Co. ശേഖരിച്ചത്: 26 November 2014. Chisholm, Hugh, ed. (1911). "Daffodil" . Encyclopædia Britannica. 7 (11th ed.). Cambridge University Press. p. 728. Doorenbos, J. (1954). "Notes on the history of bulb breeding in the Netherlands". Euphytica. 3 (1 february): 1–18. doi:10.1007/BF00028123. ശേഖരിച്ചത്: 2 December 2014. Rees, A.R., ed. (1972). The Growth of Bulbs: Applied Aspects of the Physiology of Ornamental Bulbous Crops. Oxford: Elsevier Science. ISBN 0323155863. ശേഖരിച്ചത്: 15 December 2014. Halevy, Abraham H., ed. (1985). CRC Handbook of flowering vol. I. Boca Raton, Fla.: CRC Press. ISBN 0849339111. ശേഖരിച്ചത്: 29 October 2014. Huxley, Anthony; Griffiths, Mark; Levy, Margot (1992). The New Royal Horticultural Society Dictionary of Gardening. (4 vols.). London: Macmillan. ISBN 978-0333474945. Lloyd, David G; Barrett, Spencer C.H., eds. (1995). Floral biology : studies on floral evolution in animal-pollinated plants. New York: Chapman & Hall. ISBN 0412043416. ശേഖരിച്ചത്: 29 October 2014. Leeds, Rod; Hedge, Ronald; Hawthorne, Linden, eds. (1997). RHS Plant Guides: Bulbs. London: Dorling Kindersley. ISBN 0751303054. Kubitzki, K., ed. (1998). The families and genera of vascular plants. Vol.3. Berlin, Germany: Springer-Verlag. ISBN 3-540-64060-6. ശേഖരിച്ചത്: 14 January 2014. Singh, A.K. (2006). Flower crops : cultivation & management. New Delhi: New India Pub. Agency. ISBN 8189422359. ശേഖരിച്ചത്: 7 November 2014. Duke, James A. (2007). Duke's Handbook of Medicinal Plants of the Bible. Hoboken: Taylor & Francis Ltd. ISBN 0849382033. ശേഖരിച്ചത്: 29 October 2014. Leyel, C. F. (2007). "Herbs for the Skin". Cinquefoil. Pomeroy, WA: Health Research Books. p. 289. ISBN 0787314137. ശേഖരിച്ചത്: 3 November 2014. Mabberley, David J (2008). Mabberley's Plant-Book (3 ed.). Cambridge University Press. ISBN 1107782597. ശേഖരിച്ചത്: 8 January 2014. Williams, D. M.; Knapp, Sandra, eds. (2010). Beyond Cladistics: The Branching of a Paradigm. University of California Press. ISBN 0-520-26772-9. ശേഖരിച്ചത്: 15 February 2014. Rina Kamenetsky; Hiroshi Okubo, eds. (2012). Ornamental Geophytes: From Basic Science to Sustainable Production. CRC Press. ISBN 1-4398-4924-2. S.J. Enna, S.J. ; Norton, Stata (2012). "12. Daffodil (Narcissus pseudonarcissus)". Herbal Supplements and the Brain: Understanding Their Health Benefits and Hazards. Upper Saddle River, New Jersey: FT Press Science. pp. 149–160. ISBN 0132825015. ശേഖരിച്ചത്: 29 October 2014. Cullen, James (2011). "Narcissus". എന്നതിൽ Cullen, James; Knees, Sabina G.; Cubey, H. Suzanne Cubey. The European Garden Flora, Flowering Plants: A Manual for the Identification of Plants Cultivated in Europe, Both Out-of-Doors and Under Glass (vol. 1. Alismataceae to Orchidaceae) (2 ed.). Cambridge: Cambridge University Press. p. 205 ff. ISBN 0521761476. ശേഖരിച്ചത്: 21 October 2014. Tutin, T. G.; മറ്റുള്ളവർക്കൊപ്പം., eds. (1980). Flora Europaea. Volume 5, Alismataceae to Orchidaceae (monocotyledones) (Reprinted ed.). Cambridge, England: Cambridge University Press. ISBN 052120108X. ശേഖരിച്ചത്: 4 October 2014. Thomé, Otto Wilhelm (1903). Flora von Deutschland, Österreich und der Schweiz (vol. I) (2 ed.). Gera: Zezschwitz. ശേഖരിച്ചത്: 22 October 2014. Sell, Peter; Murrell, Gina (1996). "Narcissus". Flora of Great Britain and Ireland: : Volume 5, Butomaceae - Orchidaceae. Cambridge: Cambridge Univ. Press. pp. 285–293. ISBN 0521553393. ശേഖരിച്ചത്: 29 October 2014. "Narcissus". Flora Iberica. Real Jardín Botánico. 2014. ശേഖരിച്ചത്: 29 October 2014. Cebrian, Jordi (2014). "Flora Catalana". ശേഖരിച്ചത്: 31 December 2014. Quiles, José (2014). "Flora silvestre del Mediterráneo". ശേഖരിച്ചത്: 1 January 2015. "Narcissus". Flora of China: Vol. 24. p. 269. ശേഖരിച്ചത്: 15 October 2014. Straley, Gerald B.; Utech, Frederick H. (2003). "Narcissus". Flora of North America vol 26. pp. 53–54. ശേഖരിച്ചത്: 19 October 2014. Gathe, J; Watson, L (2008). "Narcissus L." Florabase: Western Australian Flora. Western Australian Herbarium. ശേഖരിച്ചത്: 2 December 2014. Krelage, JH (17 April 1890). "On Polyanthus Narcissi". Journal of the Royal Horticultural Society. 12 (Daffodil Conference and Exhibition): 339–346. ശേഖരിച്ചത്: 25 December 2014. Wylie, Ann P (1952). "The history of the garden Narcissi". Heredity. 6 (2): 137–156. doi:10.1038/hdy.1952.16. ശേഖരിച്ചത്: 4 October 2014. Meyer, Frederick G (April 1961). "Exploring for Wild Narcissus" (PDF). The American Horticultural Magazine. 40 (2): 211–220. ശേഖരിച്ചത്: 19 October 2014. American Horticultural Society (January 1966). "The Daffodil Handbook". Amer. Hort. Mag. 45 (1). ശേഖരിച്ചത്: 19 October 2014. Mcintosh, P. D.; Allen, R. B. (January 1992). "Narcissi bulb production at southern South island sites, New Zealand". New Zealand Journal of Crop and Horticultural Science. 20 (1): 17–27. doi:10.1080/01140671.1992.10422321. ശേഖരിച്ചത്: 20 December 2014. Chow, Y (1993). "Basal Plate Tissue in Narcissus Bulbs and in Shoot Clump Cultures: Its Structure and Role in Organogenic Potential of Single Leaf Cultures". Annals of Botany. 71 may (5): 437–443. doi:10.1006/anbo.1993.1057. ശേഖരിച്ചത്: 1 December 2014. Dobson, Heidi E.M.; Arroyo, Juan; Bergström, Gunnar; Groth, Inga (December 1997). "Interspecific variation in floral fragrances within the genus Narcissus (Amaryllidaceae)". Biochemical Systematics and Ecology. 25 (8): 685–706. doi:10.1016/S0305-1978(97)00059-8. ശേഖരിച്ചത്: 1 December 2014. Dana, Michael N.; Lerner, B. Rosie (1 April 2001). "The Narcissus". Purdue Extension: Horticulture (HO-11-W). ശേഖരിച്ചത്: 20 December 2014. Spaulding, Daniel D.; Barger, T. Wayne (2014). "Key to the wild daffodils (Narcissus, Amaryllidaceae) of Alabama and adjacent states" (PDF). Phytoneuron. 82: 1–10. ISSN 2153-733X. ശേഖരിച്ചത്: 3 November 2014. Pugsley, H.W (1933). "A monograph of Narcissus, subgenus Ajax" (PDF). Journal of the Royal Horticultural Society. 58: 17–93. ശേഖരിച്ചത്: 20 October 2014. Meyer, F. G. (January 1966). "Narcissus species and wild hybrids" (PDF). Amer. Hort. Mag. 45 (1): 47–76. ശേഖരിച്ചത്: 19 October 2014. Webb, DA (June 1978). "Taxonomic notes on Narcissus L". Bot J Linn Soc. 76 (4): 298–307. doi:10.1111/j.1095-8339.1978.tb01817.x. ശേഖരിച്ചത്: 23 October 2014. Fernández-Casas, Francisco Javier (2005). "Narcissorum notulae, VI" (PDF). Fontqueria. 55: 265–272. ശേഖരിച്ചത്: 25 November 2014. Fernández-Casas, Francisco Javier (2008). "Narcissorum notulae, X" (PDF). Fontqueria. 55: 547–558. ശേഖരിച്ചത്: 20 October 2014. Medrano, M.; Herrera, C. M. (12 May 2008). "Geographical Structuring of Genetic Diversity Across the Whole Distribution Range of Narcissus longispathus, a Habitat-specialist, Mediterranean Narrow Endemic". Annals of Botany. 102 (2): 183–194. doi:10.1093/aob/mcn086. PMC 2712358. PMID 18556752. Aedo, Carlos (2010). "Typifications of the names of Iberian accepted species of Narcissus L. (Amaryllidaceae)" (PDF). Acta Botanica Malacitana. 35: 133–142. ശേഖരിച്ചത്: 29 November 2014. Fernández-Casas, Francisco Javier (2011). "Narcissorum Notulae, XXXI" (PDF). Fontqueria. 56 (26): 239–248. ശേഖരിച്ചത്: 5 October 2014. Graham, S. W.; Barrett, S. C. H. (1 July 2004). "Phylogenetic reconstruction of the evolution of stylar polymorphisms in Narcissus (Amaryllidaceae)". American Journal of Botany. 91 (7): 1007–1021. doi:10.3732/ajb.91.7.1007. PMID 21653457. ശേഖരിച്ചത്: 30 October 2014. Barrett, Spencer C. H.; Harder, Lawrence D. (2 September 2004). 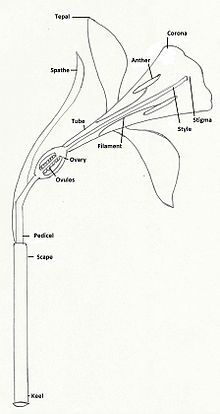 "The evolution of polymorphic sexual systems in daffodils (Narcissus)". New Phytologist. 165 (1): 45–53. doi:10.1111/j.1469-8137.2004.01183.x. PMID 15720619. ശേഖരിച്ചത്: 30 October 2014. Rønsted, Nina; Savolainen, Vincent; Mølgaard, Per; Jäger, Anna K. (May–June 2008). "Phylogenetic selection of Narcissus species for drug discovery". Biochemical Systematics and Ecology. 36 (5–6): 417–422. doi:10.1016/j.bse.2007.12.010. ശേഖരിച്ചത്: 30 October 2014. Zonneveld, B. J. M. (24 September 2008). "The systematic value of nuclear DNA content for all species of Narcissus L. (Amaryllidaceae)". Plant Systematics and Evolution. 275 (1–2): 109–132. doi:10.1007/s00606-008-0015-1. ശേഖരിച്ചത്: 30 October 2014. Zonneveld, B. J. M. (8 July 2010). "The involvement of Narcissus hispanicus Gouan in the origin of Narcissus bujei and of cultivated trumpet daffodils (Amaryllidaceae)". Anales del Jardín Botánico de Madrid. 67 (1): 29–39. doi:10.3989/ajbm.2219. ശേഖരിച്ചത്: 5 October 2014. Marques, I.; Nieto Feliner, G.; Martins-Loucao, M. A.; Fuertes Aguilar, J. (11 November 2011). "Genome size and base composition variation in natural and experimental Narcissus (Amaryllidaceae) hybrids". Annals of Botany. 109 (1): 257–264. doi:10.1093/aob/mcr282. PMC 3241596. PMID 22080093. ശേഖരിച്ചത്: 30 October 2014. Gage, Ewan; Wilkin, Paul; Chase, Mark W.; Hawkins, Julie (2011). "Phylogenetic systematics of Sternbergia (Amaryllidaceae) based on plastid and ITS sequence data". Botanical Journal of the Linnean Society. 166 (2): 149–162. doi:10.1111/j.1095-8339.2011.01138.x. ശേഖരിച്ചത്: 30 October 2014. Santos-Gally, Rocío; Vargas, Pablo; Arroyo, Juan (April 2012). "Insights into Neogene Mediterranean biogeography based on phylogenetic relationships of mountain and lowland lineages of Narcissus (Amaryllidaceae)". Journal of Biogeography. 39 (4): 782–798. doi:10.1111/j.1365-2699.2011.02526.x. ശേഖരിച്ചത്: 30 October 2014. Medrano, Mónica; López-Perea, Esmeralda; Herrera, Carlos M. (June 2014). "Population Genetics Methods Applied to a Species Delimitation Problem: Endemic Trumpet Daffodils (Narcissus Section Pseudonarcissi) from the Southern Iberian Peninsula" (PDF). International Journal of Plant Sciences. 175 (5): 501–517. doi:10.1086/675977. JSTOR 675977. John M. Riddle, John M. (September 1985). "Ancient and Medieval Chemotherapy for Cancer" (PDF). Isis. 76 (3): 319–330. doi:10.1086/353876. ശേഖരിച്ചത്: 31 October 2014. Bastida, Jaume; Lavilla, Rodolfo; Viladomat, Francesc Viladomat (2006). Cordell, G. A., ed. "Chemical and biological aspects of "Narcissus" alkaloids" (PDF). The Alkaloids: Chemistry and Biology. The Alkaloids: Chemistry and Biology. Amsterdam: Elsevier Inc. 63: 87–179. doi:10.1016/S1099-4831(06)63003-4. ISBN 9780124695634. ശേഖരിച്ചത്: 31 October 2014. Hartwell, J. L. (1967). "Plants Used Against Cancer". Lloydia. 30: 379–436. Kornienko, Alexander; Evidente, Antonio (2008). "Chemistry, Biology, and Medicinal Potential of Narciclasine and its Congeners". Chemical Reviews. 108 (6): 1982–2014. doi:10.1021/cr078198u. PMC 2856661. PMID 18489166. Pettit, GR; Cragg, GM; Singh, SB; Duke, JA; Doubek, DL (1990). "Antineoplastic agents, 162. Zephyranthes candida". Journal of Natural Products. 53 (1): 176–178. doi:10.1021/np50067a026. PMID 2348199. Pettit, George R.; Tan, Rui; Bao, Guan-Hu; Melody, Noeleen; Doubek, Dennis L.; Gao, Song; Chapuis, Jean-Charles; Williams, Lee (27 April 2012). "Antineoplastic Agents. 587. Isolation and Structure of 3-Epipancratistatin from Narcissus cv. Ice Follies". Journal of Natural Products. 75 (4): 771–773. doi:10.1021/np200862y. PMC 3372531. PMID 22413911. Pigni, Natalia B.; Ríos-Ruiz, Segundo; Martínez-Francés, Vanessa; Nair, Jerald J.; Viladomat, Francesc; Codina, Carles; Bastida, Jaume (28 September 2012). "Alkaloids from Narcissus serotinus". Journal of Natural Products. 75 (9): 1643–1647. doi:10.1021/np3003595. PMID 22917000. ശേഖരിച്ചത്: 5 October 2014. Pigni, Natalia B.; Ríos-Ruiz, Segundo; Luque, F. Javier; Viladomat, Francesc; Codina, Carles; Bastida, Jaume (November 2013). "Wild daffodils of the section Ganymedes from the Iberian Peninsula as a source of mesembrane alkaloids". Phytochemistry. 95: 384–393. doi:10.1016/j.phytochem.2013.07.010. PMID 23932506. ശേഖരിച്ചത്: 5 October 2014. Takos, Adam; Rook, Fred (31 May 2013). "Towards a Molecular Understanding of the Biosynthesis of Amaryllidaceae Alkaloids in Support of Their Expanding Medical Use". International Journal of Molecular Sciences. 14 (6): 11713–11741. doi:10.3390/ijms140611713. PMC 3709753. PMID 23727937. ശേഖരിച്ചത്: 5 October 2014. Takos, Adam; Rook, Fred (31 May 2013). "Towards a Molecular Understanding of the Biosynthesis of Amaryllidaceae Alkaloids in Support of Their Expanding Medical Use". International Journal of Molecular Sciences. 14 (6): 11713–11741. doi:10.3390/ijms140611713. PMC 3709753. PMID 23727937. ശേഖരിച്ചത്: 25 December 2014. Berkov, Strahil; Martínez-Francés, Vanessa; Bastida, Jaume; Codina, Carles; Ríos, Segundo (March 2014). "Evolution of alkaloid biosynthesis in the genus Narcissus". Phytochemistry. 99: 95–106. doi:10.1016/j.phytochem.2013.11.002. PMID 24461780. ശേഖരിച്ചത്: 31 October 2014. "Galanthamine CID 9651". PubChem. National Institutes of Health. ശേഖരിച്ചത്: 9 March 2015. Atta-ur-Rahman, ed. (1998). Studies in natural products chemistry. Vol 20 Structure and Chemistry (Part F). Amsterdam: Elsevier. ISBN 9780080541990. ശേഖരിച്ചത്: 2 April 2015. Haworth, Adrian Hardy (1831). Narcissinearum Monographia (PDF) (2 ed.). London: Ridgway. ശേഖരിച്ചത്: 20 October 2014. Barr, Peter; Burbidge, F.W. (1884). Ye Narcissus Or Daffodyl Flowere, Containing Hys Historie and Culture, &C., With a Compleat Liste of All the Species and Varieties Known to Englyshe Amateurs. London: Barre & Sonne. ISBN 978-1104534271. ശേഖരിച്ചത്: 2 November 2014. Blanchard, J. W. (1990). Narcissus: a guide to wild daffodils. Surrey, UK: Alpine Garden Society. ISBN 0900048530. ശേഖരിച്ചത്: 2 October 2014. Erhardt, Walter (1993). Narzissen: Osterglocken, Jonquillen, Tazetten. Stuttgart (Hohenheim): E. Ulmer. ISBN 3800164892. ശേഖരിച്ചത്: 18 October 2014. Hanks, Gordon R (2002). Narcissus and Daffodil: The Genus Narcissus. London: Taylor and Francis. ISBN 0415273447. ശേഖരിച്ചത്: 2 October 2014. Kingsbury, Noël; Whitworth, Jo (2013). Daffodil : the remarkable story of the world's most popular spring flower. Timber Press. ISBN 1604695595. ശേഖരിച്ചത്: 8 November 2014. Cook, Danielle. "Daffodil". മൂലതാളിൽ നിന്നും 31 May 2014-ന് ആർക്കൈവ് ചെയ്തത്. ശേഖരിച്ചത്: 14 November 2014. Johnston, Brian (April 2007). "A Close-up View of the "Daffodil"" (Close up images). Micscape Magazine. ശേഖരിച്ചത്: 14 November 2014. Kraft, Rachel (April 30, 2001). "Propagation of Daffodils (Narcissus pseudonarcissus)". Plant Propagation. North Dakota State University, Department of Plant Sciences. ശേഖരിച്ചത്: 14 November 2014. Trinklein, David (2007). "Spring Flowering Bulbs: Daffodils". University of Missouri Extension. ശേഖരിച്ചത്: 25 October 2014. Van Beck, John; Christman, Steve (3 Oct 2005). "Narcissus". 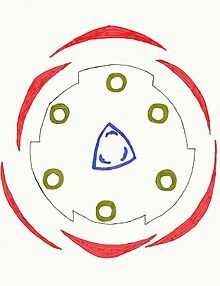 Floridata. ശേഖരിച്ചത്: 25 October 2014. Vigneron, Pascal. "Narcissus". Amaryllidaceae.org (ഭാഷ: ഫ്രഞ്ച്). ശേഖരിച്ചത്: 23 October 2014. "Daffodil Festivals and Fields". ശേഖരിച്ചത്: 3 November 2014. "Narcissus" (Image galleries). Dryad Nursery. 2014. ശേഖരിച്ചത്: 12 November 2014. "Narcissus (Narcissus spp.)". UC Pest Management Guidelines. Agriculture and Natural Resources, University of California. Integrated pest management program. March 2009. ശേഖരിച്ചത്: 21 November 2014. Steinbergs, A (2008). "Daffodils". Spring-flowering Bulbs. The Plant Expert. ശേഖരിച്ചത്: 26 November 2014. "Narcissus Horticultural Tips". Van Engelen. 2014. മൂലതാളിൽ നിന്നും 6 December 2014-ന് ആർക്കൈവ് ചെയ്തത്. ശേഖരിച്ചത്: 27 November 2014. Libertiny, Susan (5 February 2013). "Peter Barr – The King of Daffoldils". All about my garden. ശേഖരിച്ചത്: 2 November 2014. "John Gerard (1545–1612)". Historical Collections at the Claude Moore Health Sciences Library. University of Virginia. 2007. ശേഖരിച്ചത്: 26 November 2014. Alford, David, ed. (2000). Pest and Disease Management Handbook. Chichester: John Wiley & Sons. ISBN 0470680199. ശേഖരിച്ചത്: 4 December 2014. Pirone, Pascal Pompey (1978). Diseases and pests of ornamental plants (5 ed.). New York: Wiley. ISBN 0471072494. ശേഖരിച്ചത്: 4 December 2014. Gratwick, Marion, ed. (1992). Crop Pests in the UK. Dordrecht: Springer Netherlands. doi:10.1007/978-94-011-1490-5. ISBN 978-94-011-1490-5. ശേഖരിച്ചത്: 3 December 2014. Dreistadt, Steve H. (2001). Integrated pest management for floriculture and nurseries. Oakland, Calif.: University of California, Statewide Integrated Pest Management Project, Division of Agriculture and Natural Resources. ISBN 1879906465. Smith, I.M., ed. (1988). European Handbook of Plant Diseases. Oxford: Wiley. ISBN 1444314181. ശേഖരിച്ചത്: 8 December 2014. Moore, WC (1959). British Parasitic Fungi. Cambridge: Cambridge University Press. ശേഖരിച്ചത്: 22 November 2014. Fauquet, C.M. ; മറ്റുള്ളവർക്കൊപ്പം., eds. (2005). Virus taxonomy classification and nomenclature of viruses ; 8th report of the International Committee on Taxonomy of Viruses. Oxford: Elsevier/Academic Press. ISBN 008057548X. ശേഖരിച്ചത്: 12 December 2014. King, Andrew M. Q.; മറ്റുള്ളവർക്കൊപ്പം., eds. (2012). Virus taxonomy : classification and nomenclature of viruses : ninth report of the International Committee on Taxonomy of Viruses. London: Academic Press. ISBN 0123846846. ശേഖരിച്ചത്: 9 December 2014. Tidona, Christian; Darai, Gholamreza, eds. (2012). The Springer index of viruses (2 ed.). New York, NY: Springer. ISBN 978-0-387-95919-1. ശേഖരിച്ചത്: 12 December 2014. Lee, Donald L, ed. (2010). The biology of nematodes. London: Taylor & Francis. ISBN 0415272114. ശേഖരിച്ചത്: 16 December 2014. Zuckerman, Bert M.; Rohde, Richard A., eds. (1981). Plant Parasitic Nematodes vol. 3. Oxford: Elsevier Science. ISBN 0323147038. ശേഖരിച്ചത്: 14 December 2014. Ravichandra, N. G. (2014). Horticultural Nematology. New Delhi: Springer. ISBN 9788132218418. ശേഖരിച്ചത്: 14 December 2014. Perry, Roland N.; Moens, Maurice, eds. (2013). Plant nematology (2 ed.). Boston, MA: CABI. ISBN 1780641516. ശേഖരിച്ചത്: 16 December 2014. ഈ താൾ അവസാനം തിരുത്തപ്പെട്ടത്: 06:14, 24 മാർച്ച് 2019.